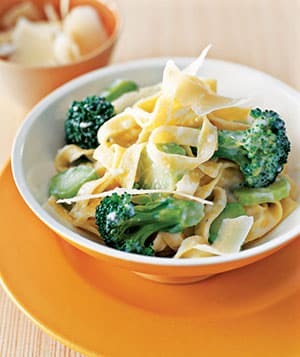 Treat your family to a delicious and healthy Italian dinner, and while still staying on track with your Weight Watchers goals, by trying out this easy Fettuccine Alfredo Recipe with Broccoli! By making a few small substitutions, and adding in a veggie, we raised the fiber and protein while lowering the fat and calories. And it’s just as creamy and fabulous and the traditional fettuccine Alfredo recipes you’ve tried before. Each serving has 9 Points, which is not bad for a nicely sized 1 1/2 cup serving. At most restaurants, that dish would cost you about 25-38 Points, making this low calorie fettuccine recipe is a pretty darn good swap. So the next time you are craving some creamy Italian pasta, try out this slimmed down version instead of throwing caution to the wind, and hitting up your fave Italian bistro. Prepare fettuccine noodles according to package instructions. Right before noodles are finished cooking, drop in broccoli and cook about 2 additional minutes. In the meantime, combine broth and garlic in a small saucepan; bring to a boil over high heat. Cover, reduce heat to a simmer and cook about 15 minutes, or until garlic is tender. Drain the pasta and place in a large bowl. Add the sauce and the fresh Parmesan; toss to coat well. Sprinkle with parsley and serve immediately. Made this for the fam tonight! Was a definite hit, thank you so much! This was delish! Very good taste!